It’s been over three decades since Green Acres went off the air. Is it time to go back to country life in Hooterville? Green Acres debuted on September 15, 1965 on CBS as a spin-off of The Beverly Hillbillies and Petticoat Junction. The sitcom followed New York attorney Oliver Wendell Douglas (Eddie Albert) as he lived out his life-long fantasy of being a farmer. 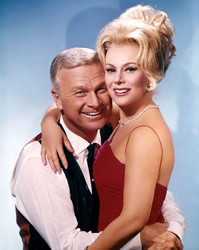 His glamorous and ditzy wife Lisa (Eva Gabor) was dragged unwillingly from her sophisticated life to live in a ramshackle farm in Hooterville. The bizarre small town was populated by a wide variety of eccentric characters like dimwitted farmhand Eb Dawson (Tom Lester), oily salesman Mr. Haney (Pat Buttram), scatterbrained county agent Hank Kimball (Alvy Moore), elderly farmers Fred and Doris Ziffel (Hank Patterson and Barbara Pepper, later Fran Ryan) and their “son,” Arnold the pig. Now, 36 years later, veteran TV director Richard L. Bare hopes that network tastes have changed. Bare directed all 168 episodes of Acres and plans to pitch a revival of the classic sitcom. He’s acquired rights from the widow of series creator Jay Sommers and wants to simply pick up where the original Acres left off. Casting is already underway for original cast lookalikes and location scouting has also begun. A script has been written by William Justice Forbes and veteran director Tom Logan has agreed to helm the pilot. Of the original cast, only Lester, Frank Cady (Sam Drucker), Sid Melton (Alf Monroe) and Mary Grace Canfield (Ralph Monroe) are still with us. None have been seen on-camera in years and Lester is the youngest of the group at age 69. It’s too early to know if any of them will be involved with this new project but, based on his long history with Acres, it seems likely that Bare will honor the original series in any way he can. Would today’s audiences be interested in returning to the crazy town of Hooterville? Will the new series get a greenlight? Stay tuned! The Beverly Hillbillies: Will Jethro Finally Get His Mansion and Casino? I LOVE the show! LOVE LOVE LOVE it ! anyways I could try to replace Eva Gabor ( pardon my modesty). I look like her A LOT, I’m from europe and I speak with accent, I could easilyt realte to her sillines and could naturally pull it of on a screen. Did this ever get off & running? Sounds like a great idea! Need a crazy and great actress? Let me know-I’m union and professional! As being part of the Pat Buttram family, we would love to see it back on again. I love Green Acres, but I think the re-cast revival is a bad idea. I saw the same thing happen to The Munsters, with well-meaning but awful re-cast shows. But I guess if you can sell advertising time for it, it could get made. But it would be a cute oddity at best, a disaster at worst. I think a reality show would be better…and I hate reality shows. Check out MR. EMMETT FREESPEECH exclusively on YouTube.com!! You can thank me later, and make sure to tell ALL your FRIENDS! You know what? It just might work! Hey, “The Addams Family” did it, why not “Green Acres?” And if you’ll remember, both shows were produced by Filmways as well as having the same music composer, the great mister Vic Mizzy! I met Tom(Eb Dawson)Lester a few years ago and I understand he’d like to get back into acting. He could guest star as Eb’s real dad like John Astin guested as Grandpapa Addams in the “Addams Family” revival. I’d rather see them spend that money on releasing the rest of the Original Series on DVD. In my opinion, a new “Green Acres” series would be a bad idea, they’d probably would add “adult humor” to it or something like that. Great idea!!! Lets all get aboard the Cannon Ball and head to Hooterville!!! I love Green Acres. I would love to see it taken on again. However you would never find anyone who could replace Eva Gabor. She made the show, But she is gone. Her sister is far to old and could not pull it off anyway. Zsa Zsa ‘s acting is nothing compared to Eva. This should never come to be.